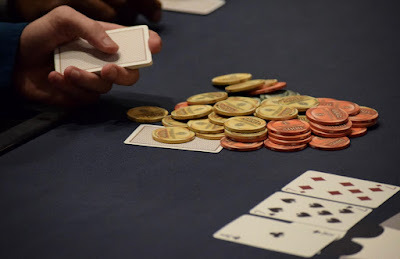 We've regaled readers for years with the Legend of the Food Coma, and today's Day 1A in the $500,000 Guarantee @WPTDeepStacks $1,100 Main Event is only helping cement the legacy in poker lore. 15-20 percent of the overall starting field in multi-day, multi-flight poker tournaments are eliminated in the first 40 minutes after dinner break concludes. Well, devout followers the Legend of the Food Coma believe players go on break, get a really good dinner, then wander back in to the poker room very relaxed and perhaps a tad unfocused on the play at hand. A few loose calls later and player-after-player is headed to the rail - sans chips - with a foggy gaze that is half-confused and half-food-satiated. 54 returned from dinner tonight ... 43 remain some 40 minutes later as a LevelUp takes place.